We have been having quite the winter here in north central West Virginia. Right now the wind chill is -15 and I have to go to Walmart. I hate the cold….and I hate Walmart, so I’m not looking forward to venturing out in this Siberian express of a mess. It just takes me back to when I was a child. I might as well just get to the point. The neighborhood kids called me Bluey. Oh, not all the kids, just the older boys who went sled riding down our backyard hill without permission. We lived in a subdivision on a corner lot with a decent hill with a nice bump in the middle which could make your sled jump in the air. It was hard to keep the neighborhood thugs away. And I call them thugs because they called me Bluey. You have to understand I looked like a poster child for anorexia, except for the fact I really did eat. I loved homemade bread and ketchup sandwiches. Of course that has nothing to do why I was called Bluey, but everything to do with the fact I probably did just enough to keep a bird alive. I had to hear that idiom all the time. “She is so skinny. I bet she doesn’t eat enough to keep a bird alive.” I have yet to see a starving bird sitting on a sidewalk… Will fly for food. So, yeah, I was quite skinny and my lips would turn blue when I got cold. My fingernails would also turn blue, but they were usually hidden under my mittens I was wearing at the time. I had mittens with the long connecting string that my mom would weave through the sleeves of my coat so I wouldn’t lose them. Of course, I did lose them at times, which even I have no idea how I accomplished that feat. So, my mom would bundle us up while smoking a Salem cigarette in one hand until she had to zipper our coats, and that’s when she would put the cigarette in her mouth and try to talk out of the corner of her mouth at the same time. I was squirming because the smoke from the Salem cigarette was entering my nose and heading down to visit my weak, naive lungs. Well, I also didn’t want to go outside…… I really didn’t want to go outside. But, it was a chance for my mom to sit at the table, drinking her Maxwell House coffee and smoking her beloved Salem cigarettes in peace as she had one child who was nicknamed Cricket because she was so hyperactive, (and sometimes nicknamed Bluey by neighborhood thugs) and another child who could move objects with her mind in the middle of a multitude of daily temper tantrums. The only normal child, my brother, couldn’t wait to get outside and sled ride all day long. I can’t even tell you how many times he walked back up that hill after flying through the air down the hill. No, I can’t even tell you because I didn’t stay out there long enough to count past 3. 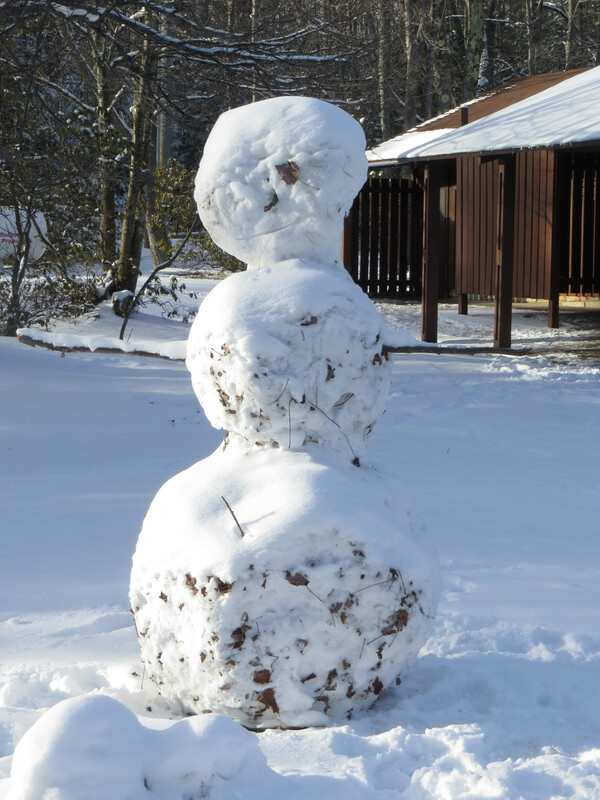 Yes, Bluey here had a self- imposed time limit of outdoor winter fun: approximately 15 minutes or the time it takes to roll the bottom layer of a snowman. I never got to put a damn carrot into a snowman’s head. I always asked for a carrot, but would usually pass it to my sister or my friends who came up the street to play with me. They knew the routine all to well. Plus, I also had to pee as soon as I put on my snow suit. And what really sucked is the fact that my mom, now calm after being separated from a hyper Mexican jumping bean and a destructive screaming meemie for a little bit, would make us hot chocolate when we came in. I hated hot chocolate. I hated chocolate milk. She knew this. “Vickie, just try the hot chocolate. It will warm you up.” Uh, I don’t see that happening……See, this is why I was hyperactive. My mom was constantly enabling my active nature with more sugar. So, I would just grab a handful of those little tiny marshmallows that for some reason are put in a cup of hot chocolate like a garnish, I guess. I never did understand how the hell hot chocolate and marshmallows went together. Does it remind people of tiny snowman parts floating in a hot chocolate bath? I didn’t get it. In the end, I guess some people just love the snow and cold and learn how to ski and snow board and become outdoor winter enthusiasts for the rest of their lives. I ain’t one of those people. I apologize for using bad grammar, but it seemed appropriate as I was writing. I ain’t one of those people. If I were smart, which apparently, I am not, I would own one of those fancy remote starters so I could start my car from the school building I teach in. I am also not smart enough to own a scraper/brush and I have to use my $.99 Walmart gloves to wipe the snow off of my windows. I don’t buy expensive gloves because, like sock monsters, there is something stealing just one of my gloves on all occasions. I need connecting mittens. I also wish I could hire one of the kids who wait for the last bus to scrape my windows, but I am sure there are child labor laws for that kind of thing. So, sitting here today, under a quilt and wearing a sweater on top of a sweater, I notice my fingernails are a little blue. Ok, that’s a lie. I have the heat cranked up to 72 degrees. My townhouse is three levels and my living room is directly above the garage, and seeing that heat rises, it is a sauna on the bedroom floor, and chilly on the living room level. It’s cold. So, this Bluey has decided to let the mail pile up for a few days. I will open the sliding door to my deck in order to fling bread out to the waiting crows, but that’s about it. We are under a winter storm warning tomorrow with a forecast of 5-8 inches of snow headed this way. You won’t see me heading to Snowshoe with skis strapped on the top of my car. No sir re Bob. And I still hate those thugs who called me Bluey…… I can hold a grudge. I may not like to build snowmen, but I pass judgement on them. This guy has no nose. This kid gets a B-. 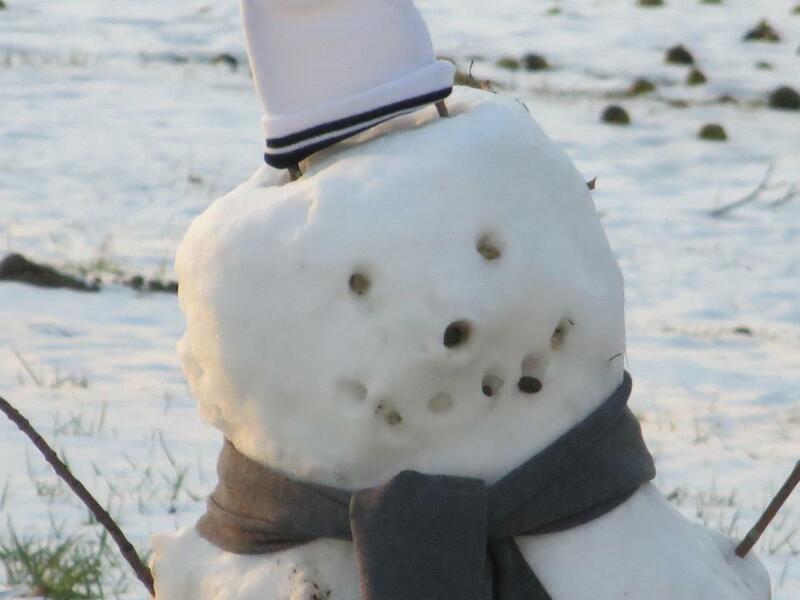 This is about what my snowmen looked like, minus the head. I loved the snow until I was old enough to be responsible for clearing a looooooooonnnnnggggg drive way. It is now significantly less appealing. My dog, however, loves it. So out I go. Hang in there! Spring will be here before you know it. you know, it is snowing and sleeting outside from the latest storm, Pandora. I keep my heat at 72 also. I guess I can’t complain about boys going on other people’s property because I did that when I was a boy. The only person that objected to it was the lady next door who once chased me with a broom. She had cement lions on each side of her front door and my sister and I liked to sit on them.